Are you using LinkedIn effectively for career success? If you’re like most people, you’re probably not. So here’s your chance to learn how to use it to its fullest potential. Come to Peirce College’s free workshop, How LinkedIn Can Help You Get a Job Faster, to learn why and how you can leverage LinkedIn to improve your career and job search process. At Peirce College, we believe in providing lifelong learning opportunities to all Philadelphians. It’s never too late to change your life, and we want to offer the support and resources you need in order to develop the new skills to do just that! Join renowned LinkedIn expert Robb Pardee as he reveals the strategies for establishing a powerful online presence using LinkedIn, the world's largest professional network. The free workshop is open to the entire community but seating is limited, so read on to find out how to reserve your spot today! LinkedIn is the most important social network for establishing a professional online presence. It’s a platform to represent yourself in the best light to prospective employers who are trying to get a handle on who you are as a job candidate. When used well, it is a powerful networking tool for fostering career growth. Plus lots of tips, tricks, and do's and don'ts for using social media! 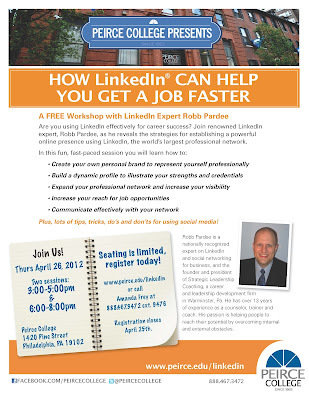 Robb Pardee is a nationally recognized expert on LinkedIn and social networking for business, and the founder and president of Strategic Leadership Coaching, a career and leadership development firm in Warminster, Pa. He has over 13 years of experience as a counselor, trainer, and coach. His passion is helping people to reach their potential by overcoming internal and external obstacles. Two sessions: 3 – 5 p.m. and 6 – 8 p.m.
Space is limited and available to registered attendees only, so register NOW to reserve your spot at http://peircelinkedinevent.eventbrite.com/. Please indicate which time session you would like to attend when registering, and be aware that registration closes on April 25! Questions? Contact Amanda Frey at 888.467.3472, ext. 9476 for more information. We hope to see you there!